GREENSBORO — Working to win over voters in North Carolina, President Barack Obama visited Greensboro last week for a North Carolina Democratic Party rally for the Clinton campaign. Deborah Ross, Democratic candidate for U.S. Senate and Congresswoman Alma Adams (D-N.C.), now running for re-election in a new 12th Congressional District, spoke to the audience before the president took the stage, urging people to get to the polls and vote. 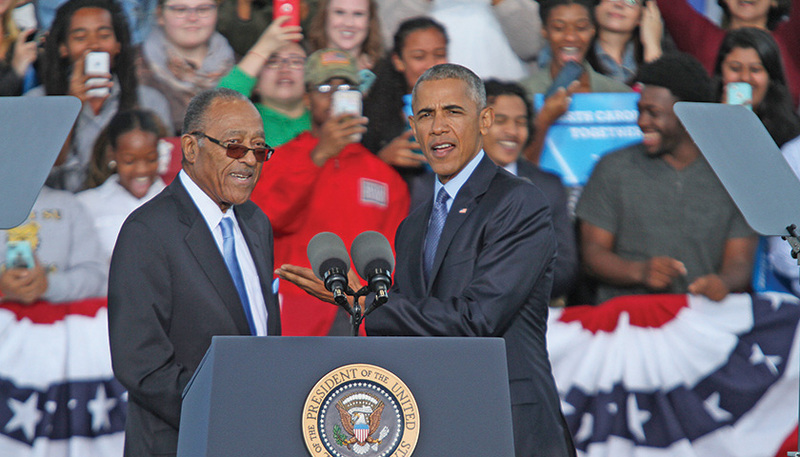 Henry Frye, the first African American elected to the North Carolina House and the first to serve on the North Carolina Supreme Court introduced the president. During the introduction, Frye stated that people should respect the right to vote, because it wasn’t long ago that people of color did not have that right. Frye himself was denied voter registration after he failed the literacy test, a discriminatory practice that was used to discourage minorities from voting. Obama took the stage and got comfortable, taking off his jacket and rolling up his sleeves in his signature fashion, before speaking for about 45 minutes to a crowd of more than 7,000 at Greensboro’s White Oak Amphitheatre. A few protestors interrupted the president and were escorted out, but Obama stayed on message. While applauding the work of Democratic presidential nominee Hillary Clinton, Obama also pointed out Republican presidential nominee Donald Trump’s public attitude towards women and minorities, his temperament to lead the country, and called into question Trump’s business techniques. “Look, Greensboro, one thing I’ve learned these past eight years is that progress is hard. It is a grind. You’ve got to battle it out. For progress to happen, we have to believe in one another. If we’re willing to work together, progress can happen,” said Obama. Just four weeks out from Election Day (Nov. 8), presidential candidates and their supporters are ramping up campaign efforts in the state. Clinton running mate Tim Kaine campaigned Wednesday at Davidson College (Charlotte), while Trump campaigned last Friday at PNC Pavilion in Charlotte, as well as at Greensboro’s White Oak Amphitheater. Trump’s running mate Mike Pence also made two North Carolina campaign stops last week. Lately, Trump has been trying to appeal to African American voters, asking the question (in front of mostly White audiences) ‘what have they got to lose?’ if they vote for him. During a recent trip to the area, Trump attempted to make a visit to Greensboro’s International Civil Rights Center and Museum however, the museum’s officials politely declined Trump’s request to use the space. Obama went on to talk about Clinton’s history of fighting for children and families, civil rights and equality and her work on climate change.